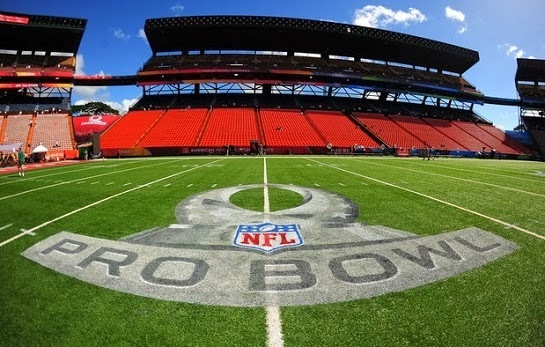 THE BLEACHER BRIEFINGS: A New and Improved Pro Bowl? A New and Improved Pro Bowl? Does everyone have their DVR set so they don't miss the big Pro Bowl Draft next week, in anticipation to see who will play for Team Rice and Team Deion? I don't mean to make light of the NFL's effort to spice things up. In fact, I applaud them for trying something different with this year's contest. Everyone who knows what a football even looks like has known forever that the yearly gathering of players in Hawaii was more of a vacation for them and their families than it was a real game. I'm just not sure this new mixing of the leagues will be the winning formula. Of course, for it to be a winning formula, we would need to know what the formula is, and as late as Thursday, things still seemed to be changing. The league announced yesterday that the top two vote getters from each conference (offense and defense) not on any of the teams participating in the title games this Sunday would be named team captains. Even though we still don't know which team they will be on. Drew Brees and Robert Quinn (both from the NFC) will be captains for one team, while J.J. Watt and Jamaal Charles (AFC) will captain the other. I can only assume that this will make them co-No. 1 picks in this draft? Not according to the NFL. Apparently, they'll be assigned to the teams prior to the draft and will assist alumni captains Jerry Rice and Deion Sanders in the draft process, although all final decisions will lie with Rice and Sanders. Add to all this the fact that Sanders announced earlier this week that he plans to suit up for the game, and you have one discombobulated mess. It comes across as the league trying way too hard to make this game interesting for the fans, and the long and short of it is that no matter how you mix these great players together, if they don't want to give it their all once the game starts, the smoke and mirrors beforehand won't matter a bit. I don't think we will see another all-star type game in any sport ever matter again. Once players in all sports became highly paid entertainers instead of athletes who needed offseason jobs to make ends meet, the desire to perform well in exhibitions was gone. It's why preseason games and spring training games in baseball don't mean anything, either. Before the skyrocketing salaries interfered, there was quite a hefty bonus attached to winning the Pro Bowl and other all-star clashes. The bonus money is still there, and of course, much more than it was back in the day. But as a percentage of salary, it is nowhere close. Years ago, a $10,000 check to the winners and a $5,000 check to the losers actually meant something, when the average salary was like $100,000. Now, with the average salary hovering around $1.9 million, the winning share of $50,000 and losing share of $25,000 hardly puts gas in the Maserati for a year. Maybe I sound a little bitter, but it's hard not to be when the Pro Bowl (and baseball's All-Star Game) were my two favorite games as a kid. Even more than the Super Bowl and World Series. Now, it's just a chance for a guy like Neon Deion to throw up a tent and turn it into a circus. Happy Pro Bowl Draft, folks. I agree. If the players are still going to go out and put forth the same type of effort it really doesn't matter what they do to try and spice things up prior. A skills challenge or a 7 on 7 flag football game would be more entertaining... Actually watching the best WRs go 1 on 1 with the best CBs, The fastest players running 40s, Kickers and punter competitions, QB in Power and accuracy Competitions. With everything adding up to a point total for each conference like an NFL Olympics... Im pretty sure they used to show those kinds of events. I actually like this idea a lot!